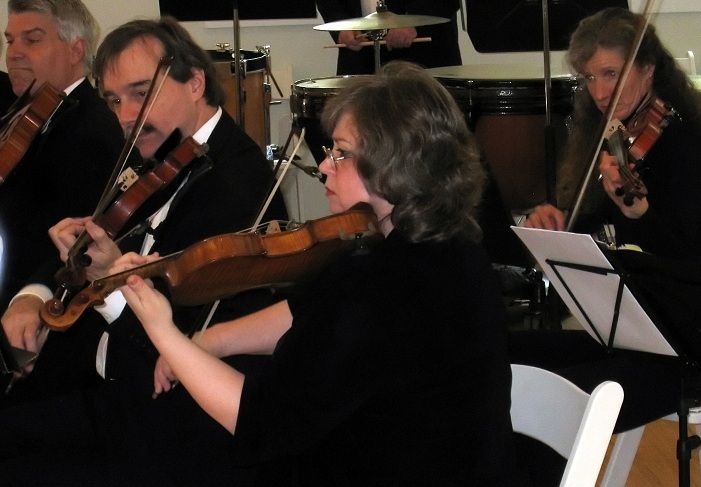 Members of the Falmouth Chamber Players Orchestra in a concert performed last spring. From left, they are Robert Knapp on viola, Fritz Sonnichsen and his wife, Laura Tutino, both on violin, and Patricia Knapp, Robert Knapp’s wife, also on violin. The orchestra includes three couples who play together. The third couple is JoAnne Caputo on violin and Frank Caputo on French horn. The Falmouth Chamber Players Orchestra, under the direction of John Yankee, will present a program of classical music favorites Saturday, November 19, at 7:30 PM and Sunday, November 20, at 3 PM. Both concerts take place at Falmouth Academy, 7 Highfield Drive in Falmouth. The 30-member volunteer orchestra will perform Handel’s “Music for the Royal Fireworks” and Beethoven’s Symphony No. 5. Steinway Artist Robert Wyatt had been scheduled to play Mozart’s Piano Concerto No. 23, but he will be unable to perform due to injuries sustained in a bicycling accident earlier this week. Young pianist Brittany Alex Rodriguez will substitute for him. Despite their sorrow over the absence of their featured soloist, the orchestra is ready to perform. Formed in the spring of 2008, the orchestra has “come a long way,” according to Mr. Yankee. The music selected for the concert by Mr. Yankee is challenging for an amateur orchestra. “Handel’s ‘Fireworks’ asks for clean, well-tuned, sometimes flourishing ensemble playing, with a clear understanding of baroque style,” said Mr. Yankee, certain that his musicians were up to the task. Performing the complete “Fireworks” is thus a major move forward. The FCPO’s version of the piece has been expanded to include a complete wind section. “There were no clarinets in Handel’s time,” Mr. Sonnichsen explained. The work was originally written for a large wind band including 24 oboes, 12 bassoons and a contrabassoon, nine trumpets, nine French horns, and three pairs of kettledrums. After the first performance, which accompanied the royal fireworks in London in 1749 to celebrate the end of the War of the Austrian Succession in 1748, Handel rescored the piece for full orchestra. “Fireworks” has five movements, including the dance form “Bourrée”; the pastoral “La Paix”; the celebratory “La Réjouissance”; the overture; and two minuets. Mozart’s Piano Concert No. 23 in A Major is indeed considered one of his finest works. Written in 1786 while Mozart was in Vienna, it has three movements, a sunny and bright opening Allegro; a slow, expressive, and somewhat melancholy Adagio, the only movement Mozart composed in F# minor; and a final Allegro Assai, a cheerful and spirited rondo. The concerto has been described as a “constant exchange of ideas” between the soloist and the orchestra and various ensembles within the orchestra. It features a piano cadenza, an extended solo passage. She also credits Mr. Yankee for bringing out the best musicianship in all of the players. A donation of $12 is suggested for adults, $5 for youth 18 and younger. The orchestra, a nonprofit organization, is supported in part by grants from the Woods Hole Foundation and the South Shore Playhouse Associates/Cape Cod Melody Tent. For more information, visit www.FalmouthChamberPlayers.org, or call Mr. Sonnichsen at 508-274-2632.